"A Step Beyond Science Fiction"
Heavy Metal is an animated film which follows the fate of Loc-Nar through six stories. This movie combines elements of heavy metal music, fantasy and adult content consisting of strong sexual themes, violence and profanity. The movie originated from the magazine called Heavy Metal. The central character of the movie is Loc-Nar, a green ball of evil influence that changes things about the people who encounter it. The movie starts with an astronaut bringing Loc-Nar to interact with his daughter. Loc-Nar proceeds to speak to the daughter about his journey through space and time. The first story begins with a cab driver called Harry Canyon and his dealings with an archaeologist's daughter who wants possession of Loc-Nar. The story involves gangs, violence, and physical intimacy between adults. The second story shows the teenager Den and his interactions with Loc-Nar. This story is the least well known of the six as it is often cut from television presentations. The third story involves Captain Sternn who is on trial in court when Loc-Nar arrives and influences the paid witness Hanover Fiste. The fourth story showcases the flight of a B-17 containing Loc-Nar's presence on the crew. The evil entity's transformation of the crew is a disturbing visual scene. This is the piece often positively reviewed by critics as being the most striking in terms of presentation and visual style. The fifth story is about a secretary and her interactions with a flight crew on a space ship carrying Loc-Nar. Compared to the other stories in the film this one is meant to be a strong contrast through comedy and innuendo. The last story is about Taarna, a Taarakian warrior called upon by a pact to combat Loc-Nar's influence. 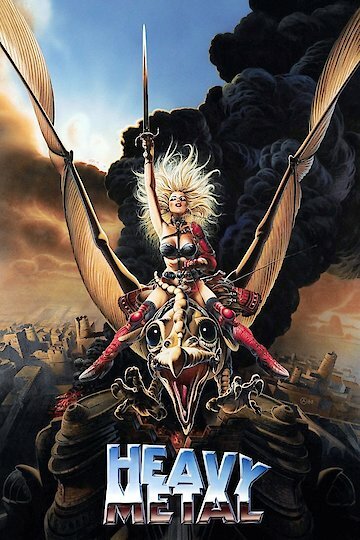 She rides a great bird and battles her way to the evil entity to deliver vengeance upon the orb. From here the story returns to the fate of the little girl in the beginning who is listening to Loc-Nar. Heavy Metal is currently available to watch and stream, buy on demand at Vudu, Google Play, FandangoNow, iTunes, YouTube VOD online.